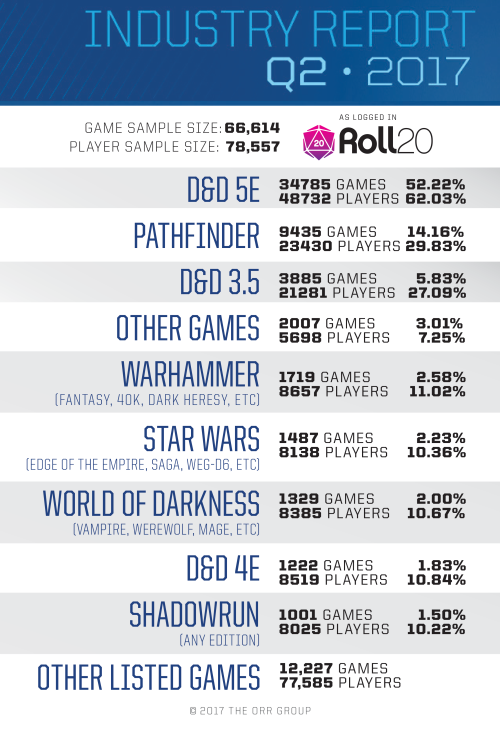 Tabletop gaming website Roll20.net released their quarterly report for Q2 2017. They break down some interesting stats on who’s playing what on the website. Unsurprisingly, Dungeons & Dragons Fifth Edition reigns supreme, representing 52% of all games and over 62% of players. D&D is still the grand-daddy of tabletop RPGs and D&D 5E has been incredibly well received and nicely supported through regular campaign books and supplements. Furthermore Roll20 has begun releasing official modules to D&D 5E campaigns, letting DMs purchase a ready-to-play adventure that can last 100 hours. We’re taking advantage of one right now in our “Storm King’s Thunder” campaign, and you can see my review of the Roll20 module “Curse of Strahd” (written and video). More Roll 20 Reviews coming soon! I’m disappointed to see Shadowrun so low. I really enjoyed our relatively brief time with that awesome cyberpunk world, and loved writing my own short stories. Admittedly the rules (Fifth Edition) are overly complex, and even worse when it comes to hacking and the Matrix. Shadowrun desperately needs a streamlined, user-friendly edition like D&D 5E. Pathfinder isn’t as big a piece of the pie as I would have expected, but as an evolution of D&D 3.5, it is getting a bit on in years at this point. I am looking forward to Paizo’s Starfinder next month. It’ll be interesting to see if the new sci-fi setting picks up on Roll20. The “Other Listed Games” category is actually the second largest, and includes dozens of game systems, including Savage Worlds, FATE, Cypher Games like Numenera, and older versions of D&D that aren’t 3.5E (3.5E is still more popular than 4E). “Other Games” is yet another umbrella category for more obscure games that have even smaller individual player bases. The best stat is that Roll20’s sample size has increased every quarter for the last six quarters. More players and DMs is always a great thing! Note that “Player Numbers” are gathered from players that have filled out the “Enjoys Playing” and “Seeks Group For” sections in their profile – which I just filled out, oops! “Game Numbers” are pulled from the “My Games” section and should reflect active games. Thus the Game Numbers will be a more accurate percentage since more people will play one game while listing multiple enjoyments. This is interesting, I’d heard that Pathfinder occupied the lions share despite the popularity of 5e, I can only imagine starfinder growing in popularity as more content and such for the system are brought into roll20. I’d love to see Starfinder take off. There really isn’t a go-to sci-fi RPG system right now. But yeah, 5E is crazy popular and successful right now. I liked Pathfinder during the 3.5/4e era but I think 5E just trumps everything right now in accessibility and flexibility. Completely agree, I’ve recently moved from pathfinder but I’m happy I learned via a heavy rules system so i can appreciate the flexibility and feel more knowledgable. I’ve certainly enjoyed being able to get new players into the game quickly without them having to worry!